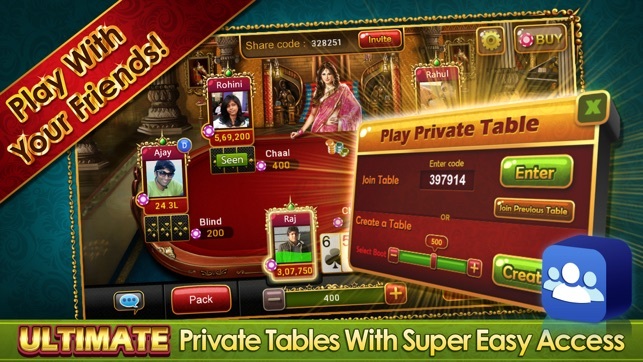 India's #1 Teen Patti App! #1 Teen Patti app in India. Teen Patti is the most thrilling card game and Ultimate Teen Patti is the number one Teen Patti app for your iOS device. UTP is powered by the makers of the biggest rummy site in India, RummyCircle.com. It offers complete reliability and a bunch of effective features. You can get this free game from App Store or via utp.in. Ultimate Teen Patti has one of the biggest user-bases when it comes to Teen Patti games. Once you download the app from App Store or utp.in, you can challenge any of the 3 million Teen Patti players from different parts of the globe. And, depending on how much you are betting on, you can win big things from these games. You can always scale your gameplay in Ultimate Teen Patti. 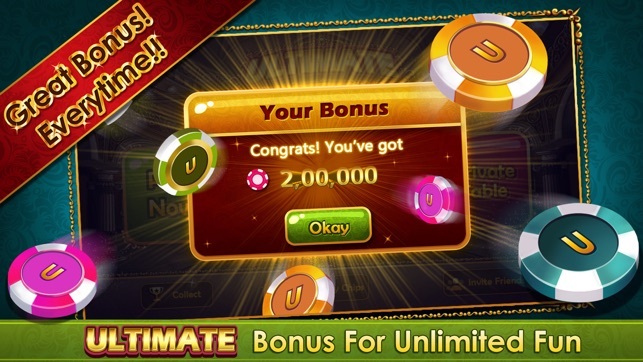 You will receive 3,00,000 free credits when you install the Ultimate Teen Patti app on your iOS. So, you can simply start playing the variety of Teen Patti games just after you have installed it. Also, you don’t have to worry about not having enough chips. 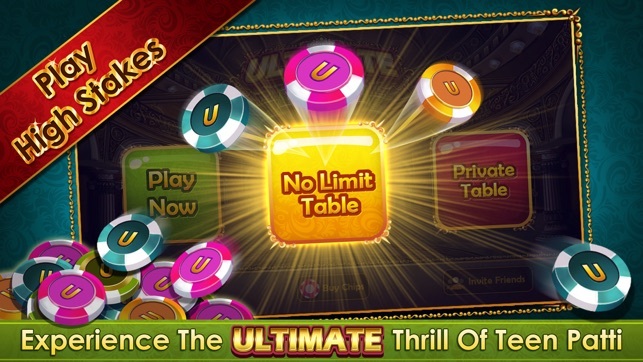 Ultimate Teen Patti will be giving you free chips every 4 hours, so that you can keep playing. Also, this app is available in both Hindi and English. If you want everything seen in Hindi, you have an option. Ultimate Teen Patti app for iOS is pretty intuitive. You can start using the app without any previous level experience. It comes with easy navigation and lets you choose the games according to your tastes. Also, it’s working fine in 2G and 3G connections, with the best gaming experience. You don’t always need a Wi-Fi to stay in the world of Teen Patti games. Ultimate Teen Patti offers more than one Teen Patti game to entertain you. Depending on your taste, you’d be able to pick the right game. -	In Classic Teen Patti game, you have lower BOOT tables. This is the stage where you can pick as per your comfort. -	In No-Limit Teen Patti, you have the complete freedom to choose the BOOT and bet. It means you’d go as higher as you want. -	Tournaments are a unique feature of Ultimate Teen Patti. You can compete with the best players of Ultimate Teen Patti community and win the awesome prizes. Teen Patti is also known as Indian Poker, and the game is popular across the globe, especially Asia. It works by making bets on card hands. There are two ways to bet chips on card hands — BLIND and CHAAL. At the end of the game, the winner will have the highest-ranking hand. He/she would also get the total chips that have been used for betting. So, Ultimate Teen Patti, available also via utp.in, is surely the best choice for playing the best Teen Patti games. The best 3 card game available.